Preheat oven to 350 degrees. Bake frozen meatballs on baking sheet for 20 minutes. While meatballs bake, cook macaroni pasta according to package directions. Drain the water from the pan. Stir condensed soups, milk and cheese sauce into cooked macaroni. Place meatballs in the bottom of a 9x13-inch pan sprayed with nonstick cooking spray. 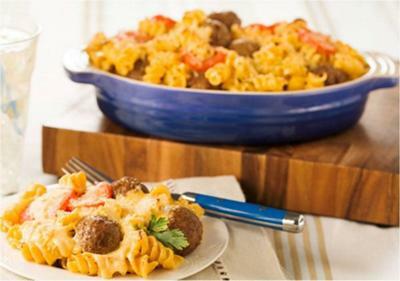 Spoon macaroni and cheese mixture evenly over the meatball layer. Lay tomato slices evenly over top. Sprinkle shredded Parmesan over top. Bake uncovered for 25-30 minutes.